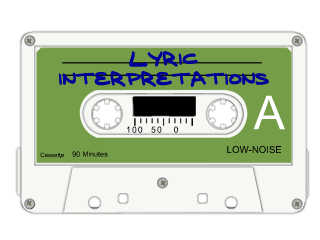 Here at Lyric Interpretations, we try our Johnny-damnedest to bring you the truest possible version of what all the songs mean. But there are times when we cruise around the web from Usenet to Twitter, that we encounter screwball theories that are just so gosh-darned lovable that we almost hate to shoot them down. So, with April Fool's Day afoot, let's give these tin-foil-hat interpretations their due. This time and this time only, the inmates get to run the asylum! Note: We're going to omit The Beatles entirely. Otherwise they'd take over the whole article. The Pink Floyd album Dark Side of the Moon is actually about The Wizard of Oz. If you haven't heard this one yet, it must be because it's your first day on the Internet. Well, you'd better catch up right away, so pack your pipe with hash and head over to the Dark Side of Oz page for a mind-blowing experience. The scarecrow does "If I Only Had A Brain" during "Brain Damage"! Dorothy enters Oz right when "Money" starts! It's a conspiracy theory, man! I've seen the Truth! Blue Oyster Cult's "Don't Fear the Reaper" and "Burnin' For You" are the same story. The singer has traded his soul to hell to save the one he loves, and reassures her not to fear the reaper because she's going to heaven. He, on the other hand, is going to hell to burn for her. La la la. The Eagles' "Hotel California" foretells the 2008 Real Estate crash and national recession. Of course, the protagonist is seduced by the promise of decadent living from wealth, but it's a trap! And when you get in over your head with mortgaged properties you can't sell, you'll end up living in hotels because you can't afford anything else and you're too broke to move out of the state. Also, The Animals' "House of the Rising Sun" is the same place, too, only you can just escape briefly to have a kid. Which perpetuates the cycle of poverty. Weird Al Yankovic has an eating disorder. Look at all his food-themed songs: "Addicted to Spuds," "Eat It," "Fat," "Girls Just Want to Have Lunch," "Grapefruit Diet," "I Love Rocky Road," "Living in the Fridge," "My Bologna," there's no end to them! Weird Al is clearly trying to exorcise the demons of his obsession with food one dish at a time. He will eventually make a song about every kind of food, or reference it in another song the way he worked 'pickled wieners' into "The Biggest Ball of Twine in Minnesota." Carly Simon's "You're So Vain" is about William Shatner. Queen's "Another One Bites the Dust," "Stone Cold Crazy," "Killer Queen," and "Bohemian Rhapsody" are all about the same character. He's a killer. And he goes "walking down the street shooting people that he meets," thinking himself a "Killer Queen," as his victims go down "Another One Bites the Dust" until finally he has to confess to his mother who comes to see him in prison, but he understates it as "I just killed a man"... what's the difference after your first one, anyway? Oh, and the structure of "Bohemian Rhapsody" is so weird because the protagonist is going through the five stages of grief for himself as he's sentenced to death for his crimes. Lady Gaga is actually serious. Oops, sorry, we made that one up. Nobody's that crazy. Tom Petty's "Don't Come Around Here No More" - It's actually about Hannibal Lecter and Clarice Starling from The Silence of the Lambs. See, there's definitely a love connection of a twisted sort between Agent Starling and Hannibal the Cannibal. "Whatever you're looking for" refers to Starling being an FBI agent seeking a killer. Clarice darkens the door of Hannibal's cell. "Stop walking down my street" is talking about the row of cells at the institute where Hannibal is held. Clarice definitely tangle's Hannibal's emotions, for he tries to scare her away even as he draws pictures of her cradling a lamb. So in the video, Hannibal is the Mad Hatter and Clarice is Alice. But he knows he's a monster, and so this song is his warning to stay far away from him - or he'll EAT HER! Carly Simon's "You're So Vain" is actually about David Geffen! I've heard that Fall Out Boy's "Sugar, We're Goin Down" and "Thnks fr th Mmrs" are about the same couple, that "Sugar" is from the girl's point of view and that "Thnks" is from the guy's. The story goes that a guy sleeps with a girl and basically uses her to find out he's gay, and the guy regrets it, but the girl is sad and pines for the guy. l remember when that song first came out, it was about her then hubby James Taylor, after a fight. l don't know the dark side of the moon lp, but l know the wall s all about David Gilmore's love and addiction to herion.